It doesn't matter if Walgreens is guilty or innocent of these charges (click here). What matters is that most of us are willing to rip off one customer in order to give another customer a good deal, while at the same time increasing sales in the short term. Consider my former company, Lands' End. Here's the original eight principles (click here please), courtesy of founder Gary Comer. Yes, you can sense the pride of the voice of the owner, can't you? And here's the six principles that the current Lands' End brand endorses ... notice that they aren't the same (click here please). Pricing is gone, and middlemen are gone, too, erased from the history of the company. The internet promised pricing transparency. Instead, pricing is more elusive and unfair than ever before. Yes, vendors do it, too. 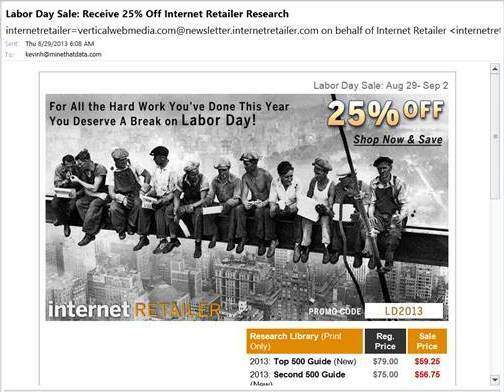 I bought both the Internet Retailer Top 500 and Second 500 guides this summer, paying $79.99 each. Today, they sent me a personalized, targeted, and highly relevant offer, giving me a chance to buy the guides again, for $59.99 each. The CRM and email gurus love this stuff. Except, of course, for the minor problem where I already bought the darn things! The email campaign (not intentionally) rubs in my face that I overpaid by $40, total. Seems like there might be a marketing opportunity in being honest and consistent, don't you think? Look at the image ... sockeye salmon, about to go on the grill. Notice that there's two different preparations. Some in the audience liked lemon, dill, salt, and pepper. Others in the audience liked butter and seasoning salt. In the omnichannel world, we're told we have to do everything the same way - same merchandise in all channels at the same price with the same promotions. Every device must emulate the business the same way. Homogenize everything, and then, as the pundits say, "just be excellent". But when it comes to food, we allow everybody to do their own thing, don't we? McDonalds can offer a McRib sandwich in Topeka but not in Toledo, and nobody cares - not one omnichannel pundit goes sideways when a restaurant ignores the omnichannel playbook. Every channel yields a unique merchandise preference. In other words, customers align with the channel that best serves their micro-niche preference. There are two big problems I've observed at least a dozen times this summer. By making everything the same, catalogers / e-commerce businesses / retailers have failed to capitalize on the differences in channels, causing profit to just sit there for Amazon to grab (and then reinvest). By focusing on marketing channels, marketers have largely ignored the merchandise differences across customer segments. By ignoring merchandising issues, businesses are not managing the right mix of new/existing items and low/high priced items, causing problems in 2013 that were created back in 2011. Without a plan for 2015, we are putting the brakes on future growth. We're ignoring differences in customer behavior. We're ignoring differences in merchandise alignment by customer segment / marketing channel. This costs us more profit than the theoretical profit opportunity offered by being omnichannel. 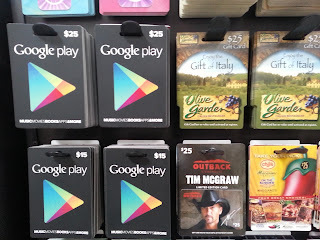 Oh, look - there's Google, with gift cards in a Wal-Mart store - right next to Olive Garden and Outback Steakhouse (who is co-branding with Tim McGraw to get attention for both) and Chili's (which really is an ad for four separate eateries within the corporate umbrella) and Apple iTunes store. The checkout at Wal-Mart - that's a place where you get some attention, right? It's a nice toll booth for big companies. Here's another way to get attention ... you can astroturf somebody taking over your Twitter feed (click here). And that "works", right? Read this (click here). The data (mind you, it's not sales data, it's not profit data, it's not people in the store data, it's not the data that you or I or your CFO use to prove that something works) prove that hacking your own account is worth it - you get attention. Or you can pull a bunch of stunts on the VMAs and really get some attention (click here). The further we are separated from merchandise, from selling, and from profit, the more attention we seek, hoping to convert attention into sales. Look at your ad-to-sales ratio ... this is a good way to measure how effective you are at purchasing attention. The best companies don't have to pay for attention. Great companies (and humans) don't need to be outrageous or dishonest, either. Hi! How was your summer? It's really winding down ... a week to go in our traditional summer. While I was away, did you spend any time talking about the future? No, not Cyber Monday 2013, I'm talking about the real future, like the year 2020? We sure do talk about the past. Recently, somebody dropped the "Lands' End cut back on catalogs in 1999 and it hurt their business, so we're not going to do that" line on me. I keep hearing that one from catalog experts. When that's what we talk about, we don't want to face the future. For too many of us, the average age of our customer increased by about five years since 2006, and is now +/- 60 years old. We can thank the co-ops for this, we can thank pundits for this, and we can thank ourselves for this. Ourselves: On the marketing side of the table, we completely ignored merchandise productivity. We measured what sold best - we did not think about what this meant. What sold best was what appealed to a +/- 60 year old customer, causing us to offer even more merchandise for these customers, causing us to attract even more +/- 60 year old customers, creating and endless cycle of age increase. Co-Ops: We paid +/- $0.06 a pop for millions of names, and couldn't have cared less who these people were, as long as they responded. Co-ops obliged, giving us buyers who were ... wait for it ... wait for it ... +/- 60 years old! Woo-hoo! Pundits: They told us we had to be "multi-channel". We listened. We listened because it allowed us to keep mailing catalogs. The alternative was to truly compete with Amazon, and who the heck wants to do that? In order to keep mailing catalogs, we had to goose response. How did we do that? By working with co-ops, who gave us +/- 60 year old customers who liked merchandise that appealed to +/- 60 year olds, which caused our customer file to separate from the mainstream population of the United States. We are where we are, now. I suppose there's no need to look back anymore. So let's look ahead to the year 2020. We'll need to make a few assumptions, won't we? Unless we separate from the co-ops, our customer file will age another five years, and will be +/- 65 years old in 2020. Co-ops will continue to separate from us - some of 'em are actively working with Facebook and their ilk to match offline purchases to online sentiments - we will fund the research that allows them to separate from us and have a future. Think about that one for a moment - they run us into the ground, and use our funding to protect their future. Interesting, huh? Big Data, a complete lack of privacy, and the sensing of our every offline move (mobile devices track every offline bread crumb) create a real-time marketing world that catalogs have no place in whatsoever. Why send a catalog when you can respond in real time via machine learning / neural networks? We'll either create data, or we'll buy data. Catalogers have a long history of buying data. Those who buy data will struggle to generate 10% pre-tax profit levels. Hint - Amazon creates data. What happens when the average person/customer turns 65 years old? Retirement? If our merchandising strategy appeals to a 65 year old, what products and services do you think we'll be forced to offer to keep response rates high? By 2020, e-commerce as we know it will not exist. Customers 18-29 will respond to businesses that barely exist today, but will be mobile/social/virtual and therefore are competing on a level we cannot even imagine today. Customers age 30-44 (today's Jasmine) will have settled on their preferred brands. Will catalogers be a preferred brand? Unlikely. So the cataloger that struggles with Jennifer (who will be age 45-58) today will need to have Jennifer as a customer in 2020 to have a chance to succeed. Jennifer, the customer who embraced Amazon, will need to switch from whatever the Amazon-like e-commerce experience will evolve to (oh, it will be different) to a catalog-centric business model. What are the odds of that happening? Assuming that the core customer continues to age, it's going to be a splendid time for the private equity folks, don't you think? Now, we can wait to see how the world evolves between now and 2020. Heck, it's possible in late 2020 that Hillary Clinton will have earned a second term or Rand Paul will have obliterated government as we know it - either possibility causes one to stop and think. Or we can do something between now and 2020 to create our own future. Show of hands ... how many of you have a process in place to plan for Catalogs 2020? How about taking a moment to document your thoughts? What does a catalog brand look like in 2020? And what are we all willing to do to shape that future before the co-ops shape it for us? Discuss in the comments section, or send me an e-mail message (kevinh@minethatdata.com). In a typical Merchandise Forensics project, I find that about 8% of styles generate 50% of annual sales. Let that one sink in for a moment ... 8% of styles generate 50% of annual sales. There are two ways to interpret this. About 500 of 6,000 styles generate 50% of your annual sales. The success or failure of your business is based on your ability to cultivate 500 "winners". About 5,500 of 6,000 styles generate 50% of your annual sales. The success or failure of your business is based on your ability to find niche audiences that are willing to buy niche items that do not "scale", as the experts say. Through 1985 = Big Books, 60,000 styles featured, 1,000 winners. 1985 - 1999 = Targeted Catalogs, 6,000 styles featured and 500 winners. 2000 - 2013 = E-Commerce. 60,000 styles featured, 1,000 winners. Future = Mobile. 6,000 styles and just 60 winners? We don't know where tablets are headed ... are they the future, or are they the way we transition from a desktop to a true mobile device? I own a Samsung Galaxy Note II, it's big enough that I no longer use my iPad. Both can probably co-exist, but we don't know how both will evolve. One will likely win. In an environment where the screen is small, the assortment must be appropriately small as well. This greatly limits what the merchant can present you, the humble user. What you'll see will be "targeted" and "relevant". If we let the algorithms decide, there is a chance that Mobile will feature 6,000 styles and 500 winners - the algorithms would, theoretically, be able to decide who wants what and when the customer wants it. Most of us aren't comfortable letting algorithms decide. We'll want to "optimize" the experience, trying to maximize short-term conversion. This, of course, is best done by featuring the best selling items. And with so little real estate, there won't be an opportunity to cultivate 500 winners from 6,000 styles. It's more likely that our merchandise assortment will go the way of the economy - huge benefits for the 1% (of the merchandise assortment), scraps for all other items. 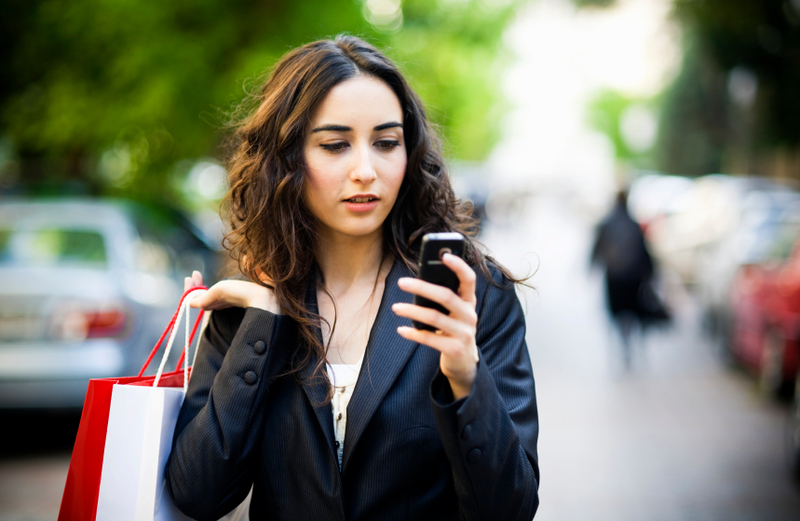 This will greatly increase the risk associated with merchandising the mobile experience. The merchant will either succeed wildly, or fail in spectacular fashion. The process of generating winners changes, necessarily. Today, you have home page real estate and landing pages and email campaigns - all allowing significant cross-shopping opportunities. Cross-shopping opportunities, in a mobile environment, sure seem reduced, don't you think? The job of the merchant/marketer becomes much harder, and much riskier, in a mobile environment. One must figure out how to show a customer five items while at the same time informing the customer about five hundred items. What a challenge! A fun challenge, no doubt. Those who figure this out will likely succeed. Those who don't figure this out will observe that the merchandise assortment shifts to an ever-decreasing number of "winners" that comprise an ever-increasing share of total demand. That, ladies and gentlemen, is a very risky place to be - it's like being The Sharper Image where a quarter of your business comes from an ionizer - something goes wrong there, and the whole brand fails. 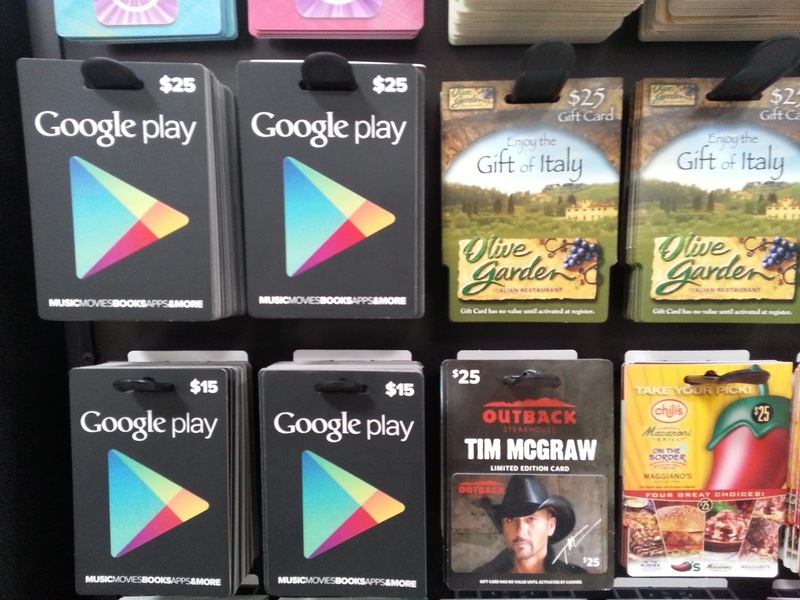 Why does the size of the "winning" merchandise assortment matter in a mobile world? Well, repurchase rates are fueled by a broad assortment. In other words, if you have 6,000 styles, you might have a 40% repurchase rate. The first 500 styles get you to a 20% repurchase rate, everything else fills in the gaps. In a mobile world, where only a few items make it to "winning" status, the repurchase rate is artificially pushed down. And if repurchase rates are artificially pushed down, then there must be a significant increase in new customers to drive the business. The business model changes, requiring a different mindset. Ok, enough of my thoughts. Your thoughts? Kevin, Why Do You View Mobile As Being Different Than E-Commerce? That's the question of the past several weeks - "Kevin, why do you view mobile as different than e-commerce?" Let's go back to the 1995 - 1999 timeframe. E-commerce was a spec on the commerce scene - lots of chatter, not much in the way of annual sales. Now, how did you find out about different e-commerce businesses? Maybe Yahoo!? Portals were like the evolution of the phone book. We could not envision that we needed search the way we eventually needed search. Search was the "killer app" of the e-commerce generation. Once Google solved search (and nobody saw Google coming in 1999 - be honest with yourself), and once Amazon solved site search, Jennifer (you remember Judy / Jennifer / Jasmine, right?) was liberated. She did not turn back to the old-school version of marketing (catalogs). She searched and she searched and she sampled companies and then she bonded herself to Amazon to the point where she pre-pays $79 a year just to get deliveries sent quickly. She pays $79 for the right to buy merchandise in the future, you offer merchandise at 20% off plus free shipping and struggle to compete. Wow. It didn't matter that you had an integrated, branded experience, fueled with a catalog that drove you to a website. The killer app, search, transformed Jennifer. For catalogers, the tail of the demographic spectrum was cut off - Jennifer and Jasmine left. Today, catalogers are on an island, with a 55+ rural audience that needs catalogs, still plenty of room for profit (as I measure every day), but on an island nonetheless. Catalogers experienced "the opposite" outcome - they were told that e-commerce and multichannel would save them. Instead, e-commerce accelerated catalogers into the embrace of a niche audience. This brings us to e-commerce. My thesis is that mobile is not an extension of e-commerce. Yes, I get it, my thinking is opposite of your thinking. We view mobile as an extension of e-commerce because mobile does not yet have a killer app. E-commerce needed search. We don't know what mobile needs. Yet. And we won't know what mobile needs until it hits us in the face and we say "duh", and when that happens, e-commerce is in trouble. Why is e-commerce in trouble? The killer app will be fundamentally better than e-commerce. It will be a fusion of mobile and social (I used to call this 'hologram marketing'), and will be infinitely more appealing and convenient (and smarter, so much smarter) than a boring website on a laptop computer in an office. When that happen, when that killer app presents itself, Jasmine will be the first to jump all over it. She will believe that somebody finally understands her. She will switch. She will bond with the killer app. Worse, the mobile assortment, by definition, is going to be simplified. It has to be simplified. Mobile does not lend itself to 6,000 styles, especially on a phone. This means that merchandise performance will be wildly skewed. Instead of 500 winners out of 6,000 styles, there will be 85 winners out of 6,000 styles. This will shift the merchandise assortment significantly, as time progresses and as Jasmine picks the 85 winners (as opposed to today, when Jennifer picks 500 winners). In response, e-commerce brands will be told to "integrate" mobile with e-commerce. They will be told that the combination of the mobile/social killer app and classic e-commerce is better, and that it appeals to all generations, and offers the full merchandising assortment. At that point, e-commerce is done. Not done as in dead. But e-commerce will be on an island, belonging to Jennifer. Jasmine will leave, she'll go where the killer app that brings mobile/social/commerce to life tells her to go. Companies will be created around this ecosystem, and Jasmine will embrace them. This will stall classic e-commerce growth (no more +15% or +30% growth year after year after year), and you'll see the e-commerce crowd add mobile sales to e-commerce to make e-commerce look good, just like retailers today add e-commerce to store sales to make comp store sales growth look good. Wait, that's already happening! Folks already add mobile sales to e-commerce. Oh boy. In Digital, we've learned that there is only one winner. Google. Amazon. Facebook. Netflix. There will be a mobile + social + commerce version of Google, Amazon, and Facebook, fueled by a mobile + social + commerce killer app, embraced by Jasmine. Big books ... JCP and Sears and Spiegel ... they were killed by targeted catalogs. Targeted catalogs were killed by e-commerce. E-commerce will be killed by a fusion of mobile + social + commerce ... we just can't see it yet, because we haven't seen the killer app that will facilitate this transition. Rest assured, it's coming. This is what history teaches us. How many of you shop Gimbels, Montgomery Wards, or Kresges? Each generation embraces a technology that is tailored to the needs of the generation. This is why I am so opposed to omnichannel. It's a noble concept, one full of hope. It assumes that history can be avoided (big books to targeted catalogs to e-commerce), that this time, folks can avoid the course of history by simply creating a world where all customers love all devices, landing in a frothy mug of commerce fueled by twenty-seven devices and two physical channels. When the mobile + social + commerce killer app arrives, omnichannel is finished - customers (Jasmine) will run to the killer app, and will align around 1-2 screens (TV and Phone - those are my early guesses). Look out for this killer app. It's coming. And when it comes, e-commerce is in trouble. Time for your thoughts - go! And please think. Don't quote a Woodside Research report that costs $499, that's not thinking. Craft a narrative. Use the comments section to craft your narrative. If there are good ones, I'll publish them in a separate blog post, with your permission. Many retailers now post comp store sales numbers with the inclusion of e-commerce. Omnichannel experts celebrate this as a step in the full digitization of a retail brand, silos being torn down in the hopes of serving a modern customer. 2012 Retail Comp Stores = $1,000,000. 2012 Online Total = $200,000. 2012 Blended Comp = $1,200,000. 2013 Retail Comp Stores = $950,000. 2013 Online Total = $280,000. 2013 Blended Comp = $1,230,000. Reported Comp Store Sales Metric = ($1,230,000 / $1,200,000) - 1 = +2.5%. Do you see what was hidden? Retail comps are actually -5%. Online demand is actually +40%. The blended average is a +2.5% comp, reported to the financial community. Here's the thing, folks. Let's look out ten years. Say that retail comps erode at a -2% rate each year, for the next ten years ... and say that retail fixed costs increase at a 3% rate, each year, for the next ten years. At that point, you have a rift in the retail profit and loss statement. This is what the CFO is going to see. 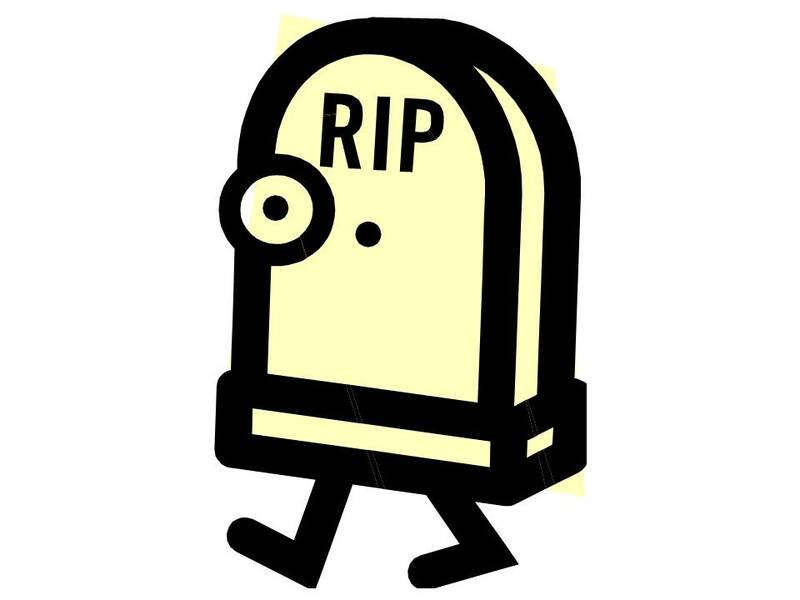 Regardless of all the attribution wizardry that folks will dream up, the CFO is going to look at a black-and-white report, and come to the conclusion that stores are in the process of dying. And it won't be hard to disagree with the CFO - the stores will be somewhat empty, right? In the example above, there's going to be 20% fewer people in the store. This will create two problems. A desire to close under-performing stores, because of the profit illustrated in the table above. The closed store will cause the website and mobile presence to under perform due to a lack of traffic ... former retail customers stop window shopping on the website (many of us observe this when a store closes). This will cause the website/mobile presence to perform differently, causing online analytics experts to conclude that things like large orange buttons are no longer drawing traffic (when in reality, traffic disappeared because the store closed), causing creative changes to the website that further impact traffic and, worse, conversion. Maybe worse, traffic via mobile will drop, because the store is closed, so the experts will say that the brand is doing "omnichannel" wrong, causing a cascading set of problems. I want for you to take a few moments, right now, and think about the consequences of the omnichannel magic you're being sold. Increasingly, the website experience is subsidizing declining store sales. At some point, website growth will slow/stop (after it finishes cannibalizes other demand sources and mobile starts cannibalizing e-commerce). If you were CEO/CFO, would you keep a store open that is probably generating sales across all channels, but has 60% of the foot traffic that it had back in 2003? The CMO is going to, as folks say, have some 'splainin' to do. It will be necessary to teach that somehow, all of this stuff fits together and yields the same amount of sales that have always been generated. And then the CFO will ask why she has to pay more for all of these channels that ultimately yield the same amount of sales! CMOs and CFOs are always working together to kill old-school marketing channels, then noticing that sales don't decrease. Regardless of attribution methodology, stores are going to be under severe pressure, due to increasing fixed costs. Retailers with high debt loads will be caught in a trap. This omnichannel thing is going to get interesting, don't you think? More screens, more problems! Click here to read this ditty about Macy's, a brand who self-labels themselves as "America's Omnichannel Store". Second quarter results were not good, with a comp store sales decrease. Were we not told that omnichannel is the path to riches? Here's what is happening folks. We've got two camps. Add Warmth To Online (read this story about Zappos, click here). I get emails and calls from the online camp - they want to know the "secrets" to offline marketing success - they want to know how to add warmth to a cold, sterile, search-centric shopping function that, by and large, has not been rescued by social media (and could quite possibly be obliterated by mobile in several years) - seeking to get the right offer in front of the right customer at the right time. I get emails and calls from the retail side of the world - they want to know the "secrets" behind digitizing a business via big data - seeking to get the right offer in front of the right customer at the right time. I don't think there's any such thing as omnichannel. It's a confection, dreamed up by trade journalists, researchers, bloggers and consultants to explain an overriding concept that is hard to grasp. Retailers want to digitize their experience, to enable them to keep doing what they love, which is, of course, in-store commerce. Online folks want to create a much warmer and more social experience, to enable them to keep doing what they love, which is, of course, e-commerce. In other words, omnichannel is real, but it is not a solution. It's a response to fear. Both retailers and e-commerce businesses are fearful of mobile (my opinion - I could be 100% wrong). We went through this 10-15 years ago with catalogers. Fear. It was everywhere. So the experts decided that being multichannel was the key. Everything you read today about omnichannel we read 10-15 years ago about multichannel. How did multichannel work for catalogers? How will omnichannel work for retailers or e-commerce folks? I analyze a lot of data. The data shows that it is hard for older generations to permanently switch to new channels. This traps existing companies in the business model they've always enjoyed. The data also shows that younger customers spend time exploring, then adhere to newer channels. Today, that's a fusion of mobile/social. Folks - omnichannel = fear. It's fear of what the future holds. It is a logical response, trying in some way to fuse the past to the future, so that we can continue working on the things we loved working on in the past. If omnichannel was the answer, then Macy's would be outperforming everybody. Instead, they're struggling, again. And they'll fix their problems, again, but omnichannel won't be the solution. Merchandise, that will likely be the solution. I'm at 2,500 blog posts. That's a lot of writing! What I don't get is a lot of feedback about why you read this content. I mean, the content is directed ultimately at two audiences ... Executives, and Analysts. That's a tough line to straddle! So help me out today ... in the comments section (or email me at kevinh@minethatdata.com), please do the following. Tell me why you read the blog. Tell me where you found about about the blog. Tell me what you like best about the blog. Tell me what you don't like about the blog. Tell me the type of content you want me to cover in 2014 and beyond. Tell me what I'd have to do to cause you to hire me. If you're not comfortable saying this in the comments section (anonymously is fine), please email me and provide feedback. "Oh yeah? Well, at least I'm not like these folks in London tracking your every physical movement via wi-fi and garbage cans! (click here)". The reality, of course, is that maybe I'm not fundamentally different than folks who want to cookie you or and measure every step you take (literally) with your phone. In other words, we're kind of the same. It's what we do with information that differentiates us, I suppose. Too many marketing/analytics experts are heading toward "sensors". In other words, they're trying to measure (sense) every aspect of an individual's life. The trend is toward capturing everything, the theory being that if you know everything, you can give the right message at the right time to the right customer. This is big data. And it can be used to give you a 25% discount at Pottery Barn. Or it can be used in this manner (click here). But that's it. All of this data, calibrated around a coupon. My goodness. Here's what I've learned, over the course of a 25 year career. We aren't all mining data. We make choices as to how we contribute. There are at least four ways that somebody like me can contribute. 1 foot level. This is where you leverage big data via data mining / algorithms to understand 1 foot level customer behavior. The end result is a 25% discount at Pottery Barn, coupled with technology/software (hint - apps and what comes after apps) that enable delivery of the 25% discount. This is where 80% of the focus will be, and always has been. Translator. This is where I believe I fit. I can take 1 foot level data and roll it up to something that can be digested by business leaders. I believe that almost nobody operates at this level, it's the reason that, since taking Dale Carnegie training in 1994, I've tried hard to occupy this realm. Not surprisingly, my career took off when I decided to leave the 1 foot level and become a Translator. This is a huge hole that needs to be filled. Punditry. This is where 19% of the focus is. If you're not a true practitioner (at the 1 foot level), this is where you get to make a difference, writing articles like "Eight Ways That Google Maps Will Change Business Forever, And Why Your Business Is Dead Unless You Adapt Today". This is called "thought leadership". Unfortunately, our ecosystem is designed to reward this path with page views, and page views bring ad dollars, and ad dollars attach strings. This is the path that many take - you get paid taking this path. Visionary. This is where 1% of the focus is. One might compare this path to the one catalog legend Don Libey took ... recall that 10-20 years ago, he frequently predicted what might happen today (famously calling big box stores 'cities of the dead', remember?) ... never being specifically right but always being directionally accurate, far more accurate than any of the pundits ever were. This is the complete opposite of punditry - usually less financially rewarding than punditry, winning fewer awards and garnering less attention - but probably being the most needed function in marketing/commerce today. Go ahead, write down a list of folks who fill the "visionary" function today, you'll find it is a short list. Each style serves a purpose in the ecosystem. The visionary speaks of a physical retail world where all behavior is tracked, long before it happens (think 2000 - 2005). The pundit is always behind the visionary, finally labeling the term "omnichannel" in 2011-2012, predicting (usually incorrectly) how omnichannel will change the world at a time when the visionary has already moved on. Think about the omnichannel chatter today ... Macy's is struggling, yet you keep reading how they are an omnichannel darling. Pundits spin messages, generating page views, generating ad dollars, regardless of the message. The translator helps the business leader understand how omnichannel issues at the 1 foot level align with sales and profit, bridging the gap between the reality of 1-foot-level work and false punditry. The translator must be honest, must work with integrity, and must represent how customers behave, not how others want customers to behave. The 1 foot level worker puts sensors in a retail store, collects the data, integrates the data, analyzes the data, and creates an app that offers a 25% discount the minute the sensor measures the fact that the customer walks into the store. The 1 foot level worker isn't stupid or evil, s/he is simply doing what the marketplace demands. The marketplace demands discounts and promotions that are offered via sensors. The marketplace, fueled by the pundit, love talking about discounts and promotions ... they get ad dollars when they talk about discounts and promotions (think Cyber Monday, a complete confection). Notice, by the way, that while pundits get paid top dollar, they're seldom discounting their own services, are they? They demand that you discount your goods and services, they demand that you pay top dollar for their goods and services. Something to think about, huh? In the first six years of my career, I tried to be the best "1-foot-level" worker in the world. This was impossible, of course. There are too many excellent "1-foot-level" workers, and there will always be an incoming crop of "1-foot-level" workers with even better skills. This is a battle that is really, really hard to win. Darwinistic forces almost guarantee you'll be obsolete in no time. In the second six years of my career, I went from Analyst to Vice President, by being a Translator. It turns out that business leaders don't have access to visionaries, and they don't understand the geeky world of "1-foot-level" workers, so they turn to pundits. By turning to pundits, business leaders are always one step behind the curve (while being told they are always one step ahead of the curve). The translator profitably bridges the gulf between the imaginary world of the pundit, and the physical, 1-foot-level world where the future is being hard-wired. For catalog marketers, this means that I identify the half of the audience that requires far fewer mailings, generating huge increases in profit for catalogers. I fill the gap between the 1-foot-worker (co-op models) and the pundit (you must mail more catalogs, not fewer catalogs, Lands' End learned they had to mail more in 1999). For retail marketers, this means that I measure the impact of search on comp store sales, illustrating how the merchandise preferences change and evolve among search buyers. I fill the gap between the 1-foot-worker (search vendor) and the pundit (be social or your business is dead). I show you how paid search impacts the five year trajectory of in-store sales. This is the essence of translation. For e-commerce marketers, this means that I measure the impact of new merchandise on the future health of your business. I fill the gap between the 1-foot-worker (optimizing conversion rate at a product level or optimizing large green buttons against small orange buttons) and the pundit (get on Amazon now or you are dead). I show you how new merchandise is the lifeblood of your business. I think you have to have amazing gifts to be a Visionary, or to be a truly effective 1-Foot-Worker. The pundit is skilled at convincing others to do what allows the pundit to get paid. You only need to be able to communicate to be a Translator. You need to be able to see where trends are heading, then fill the gaps with products/services/communication that enable Executives to generate profit in directions opposite of where most in the market are headed. Since taking this approach in 1994, I have had a successful career. Since starting my own business in 2007, I've worked with more than 100 clients. Translation skills eventually "scale", as the pundits say (oh oh), allowing me (as a translator) to be able to connect more dots than the average person, allowing you to generate more profit. I've been able to identify between $20,000,000 and $40,000,000 in profit opportunity for my clients in the past three years alone, by simply filing the hole between Pundit and 1-Foot-Level worker. Anybody can be successful - yes, even the Pundit - when the Pundit works with honesty and integrity, the Pundit becomes a Brand, and as we know, many Brands can be trusted. I've learned, over the course of twenty-five years, that you have to be excellent at something. I've worked hard to be an excellent Translator. You might choose to be an excellent 1-Foot-Level employee. You might be a Visionary. Looking ahead to 2014 and beyond, we have a ton of choices to make. As business leaders, we're going to have to decide just how far into the big data rabbit hole we want to go. I think we're headed in three different directions. Creators. These folks will create merchandise or content. What we create gets sucked into the big data ecosystem, it's the fuel that keeps the big data ecosystem moving (it keeps the pundits talking, too, allowing them to make a living). This is what Apple did in the prior decade - they created the merchandise (iPod, iPhone, iPad) that fueled the social/mobile ecosystem. Creators get paid. Miners. These folks will capture merchandise/content, repackage it, then sell it. This is what Google did, a decade ago. This is ultimately what Amazon does. The best 1-foot-level workers are outstanding Miners. Miners get paid. Users. That's the rest of us. Our information gets harvested by creators/miners, is repackaged, and is sold back to us. This is a crazy world - we create information that we are forced to purchase - we purchase what we create - we purchase access to our own customers, for crying out loud, purchasing the data that our own customers generated on our (and their) behalf. My catalog clients became Users almost twenty years ago - Co-ops were the Miners. Think about this crazy relationship. Catalogers create merchandise, customers buy merchandise, catalogers freely give customer information to co-ops, co-ops repackage/mine the information, then resell it back to catalogers. This is a terrible deal for catalogers. But this is how things evolved. Catalogers willingly chose to become Users - it is so much easier to be a User. Long-term, Users lose - Users are constantly giving money to Creators and Miners. Name one cataloger over the past five years that created something so interesting and compelling that customers had no choice but to buy what was offered? When you have a great merchandising strategy, you have less of a need to purchase access to customers from competitors who have a great merchandising strategy. When you have a great merchandising strategy, you don't have to pay much to acquire customers. Mobile/Social are the future tools that Miners are using to get businesses to become Users. In mobile/social, everything can be tracked/sensed, and if it can be tracked/sensed, it can be mined, repackaged, and sold back to those who created the information in the first place. Business leaders will be in a constant fight to stay out of the User category. Business leaders must Create. Creators generate profit. Miners generate profit. Users spend money for access to the very information they helped Miners create. My job (over the next five years) is likely to evolve. I'm going to have to spend time translating how Miners are trying to turn businesses into Users (via mobile, social, and big data). I'm going to have to spend considerable time showing you new merchandise means everything to you - it's how you align with Creators - it's how you keep from becoming a User. I think that's where my career is headed - it is going to be my job to keep you Creating, to keep you from becoming a User. It's the way I'll be different from the big data practitioner that the guest at dinner suggested I had become. Time for your thoughts - I just spent five weeks covering the first twenty-five years of my career. What questions do you have? By the end of 2012, only 27% of my projects were under the "Catalog PhD" framework. The rate is similar in 2013 ... both years down from the 60% project rate for 2010 / 2011. Times changed, and changes really accelerated in 2012. Judy ... Jennifer ... and Jasmine. Especially Jasmine. As has been well documented on this blog, our three ladies have very different behavior. Judy = Catalog shopping maven. Jennifer = Amazon - price comparison fan. Each customer audience has a different set of challenges. Catalogs, obviously, have minimal or no impact on Jasmine ... and have some impact on Jennifer. As a result, my catalog-centric project work declined, reflecting the shift in marketing tactics surrounding each customer persona. Conversely, merchandise-centric projects ramped-up, significantly, and for good reason. Merchandise issues impact Judy, they impact Jennifer, and they impact Jasmine ... always have, always will. The vendor community has not caught up with the "merchandise issue". They will. Vendors need to know that a problem is wide spread, and that a solution can be scaled with minimal incremental expense as additional clients seek a solution. By the end of 2012, more than half of projects had a strong merchandise component to them. Most interesting, of course, is that it is easier to explain why a business is succeeding/failing via merchandise than via channels or attribution tactics. Nobody publicly talks about this in the marketing literature. My email inbox, however, is filled with merchandising challenges. The disconnect between the marketing literature ... and the projects I am working on ... continues to increase. Jasmine-centric projects have merchandise problems ... Judy-centric projects have merchandise problems. The marketing tactics are usually completely opposite, while the merchandising issues are amazingly similar. Merchandise analytics are going to be an important component of our future. The main reason a customer purchases from a business is merchandise. You might buy a car from Toyota because their cars never break down and get great gas mileage. But you were in the market for a car in the first place, right? This means that the merchandise, the car, is the most important issue. A reliable car with great gas mileage is a great product, great merchandise. We all buy great merchandise. So why do we choose to ignore merchandise, hoping instead for omnichannel lightning in a bottle? P.S. : Modern software makes it terribly difficult to understand merchandise productivity issues. Show me where, in Google Analytics, you can quickly roll up a five year comp segment analysis, comparing productivity of different merchandise categories on comparable customers? We dove head-first into conversion-related issues, and after spending ten or fifteen years becoming masters at analyzing how large blue buttons convert, we did not get in the practice of understanding how a failure to create new products in 2011 causes conversion rate failures in 2013. P.P.S: Don't think merchandise issues aren't the most important topic of 2013? Go ask those who invest in Apple what they think of merchandising issues. No fundamentally new products for three years, and market share being gobbled up by Samsung, who has innovated in ways unimaginable three years ago. If you are an Executive who thinks Apple has problems, then you had better take a deep dive into your own merchandising ecosystem!! You can't look at customer behavior without thirty-nine vendors screaming at you about attribution. "Brands leveraging last-click attribution are destined for the scrapheap of obsolescence." "Our complex and proprietary algorithms enable sophisticated brands to thoroughly understand which marketing channels caused orders, and which marketing channels influenced orders." By 2011, you were behind the times if you didn't employ some level of attribution. In catalog marketing, matchback (first-touch) was/is used most often. Online marketers typically used last-touch attribution. Then you have the 99% of attribution vendors who will not let you behind the curtain to see the Wonderful Wizard of Oz. In other words, you're doing it wrong, and the experts won't say a peep about how to do it right - just trust them with your money. Worse, if you hire 100 different attribution vendors/experts, you get 100 different outcomes. Would you get 100 different outcomes in your merchandise reporting? And the experts frequently disavow testing ... the only methodology that actually tells you the impact of marketing channels. So you're stuck, aren't you? Here's a problem I was asked to analyze. "What is the value of an email click-through?" In other words, if a customer clicks through an email campaign and then does nothing, does that click add to the lifetime value of the customer? The secret, of course, is to compare equal customers ... some who just clicked-through an email campaign and did nothing ... compared to others who did not click-through an email campaign. One of the tactics you use is customer scoring. Folks score customers, predicting annual customer value based on historical RFM (recency, frequency, monetary) value plus channel overlay plus mobile/social overlay. The customer receives a predicted annual purchase rate (say 40%), and the customer receives a predicted spend amount (say $200). By multiplying the two factors together, you get a customer with $80 of next-twelve-month demand value. Each customer in the database is scored. Next, you take a group of customers with, say, $75 to $85 of next-twelve-month value (generally equal-value customers), and you segment them ... some clicked through an email campaign in the past week and did not buy, most did not click through the email campaign. Once customers are segmented - you measure spend in the next 30 days, or 90 days, or 180 days, or 365 days ... whatever you feel is the appropriate measurement window. Because the customer segments have been "equalized", the theoretical (and I repeat - 'theoretical') difference in the two customer segments is an email marketing click ... therefore, any future value is attributed to the email marketing click. Many attribution vendors use derivations of this methodology ... instead of applying segmentation strategies, they use statistical modeling to accomplish a more sophisticated outcome. Here's the thing - it's easy to explain what I did to an Executive. It's terribly difficult to say that you have a sophisticated methodology that you can't share for proprietary reasons, but your methodology is better than the segmentation/equalization technique I described so you, the Executive, just need to trust everything to the vendor. Segmentation/Equalization became terribly important in 2011, because of the explosion of mobile and myriad social channels. Beginning in 2011, most of my projects had some element of Segmentation/Equalization, used to explain to Executives what is happening to customers. Segmentation/Equalization led to "comp segment" analytics that helped illustrate that merchandise issues (not channels) were killing businesses. That led to Merchandise Forensics, a series of tools that now comprise more than half of my projects. Your attribution vendor is executing what the market wants - analysis of a bunch of orders, parsed into the theoretical marketing channels that caused the order to happen. And we need attribution, no doubt about it. That being said, your executive team realizes that the business succeeds / fails via merchandise productivity. As you go down the attribution path, you're going to realize that attribution leads you to question merchandise productivity. It has to. 2010: What If EVERYBODY Is Right? By 2010, the world was moving in many different directions. Dell generated a couple million dollars of clearance activity using Twitter, causing folks to believe that social media was the next big marketing channel. A Microsoft employee stated at a conference that any company not fully entrenched in mobile would be "out of business by the end of 2010". E-commerce continued to grow at an unfettered rate. The iPad signaled the promise of Tablet Commerce. Many catalogers (yes - catalogers) were thriving. My research showed several interesting findings. Catalog customers did not respond to social media or mobile. E-commerce brands with young customers did not respond to catalogs. Customers within 5 miles of a store overwhelmingly preferred the in-store experience over the e-commerce experience, using the website to facilitate the in-store buying experience. An ever increasing number of purchases could be attributed to numerous marketing channels. An ever increasing number of purchases would still happen, if all of the marketing activities stopped. This told me that EVERYBODY was right. If your customer is one of a million that loves "social shopping", then yes, social media works. If your customer is one of forty million that love e-commerce, then yes, e-commerce will grow at epic rates. If your customer is 55+ and lives in a rural area, well, then, there's no better channel than a catalog to engage a customer. If your customer lives within 5 miles of a store, then 80% or more of customer purchases have nothing to do with digital marketing and are hopelessly mis-attributed. If your customer is 27 years old and can't live without a smart phone, then yes, mobile means everything. In 2010, it became evident that Google + Apple + Amazon + Facebook + Twitter + Verizon + Comcast gobbled up the world, while at the same time blowing customers into their own micro-niches. Depending upon your customer, you could prove that anything/everything worked. This created enormous opportunities. Because attribution folks, on average, were terribly over-stating the impact of marketing channels on purchases, a fortune could be made by MARKETING LESS, not by marketing more as was being sold by the punditocracy. Starting in 2010, I could easily find $1,000,000 in incremental profit per $100,000,000 catalog / e-commerce / retail brand. The key wasn't to do everything (what became known as omnichannel). The key was to identify who the customer was, the demographic cohort the customer belonged to, then to reduce wasteful marketing to that cohort. To me, 2010 was the year that customers crawled into their micro-niches, thanks to social and search and mobile. We still haven't learned how to deal with micro-niches. As a result, everybody is shouting at you, telling you "how" to do things. And when you do what the experts tell you to do, their tactics don't work. Of course they don't work! They can't work. Your customer, and your unique circumstances, dictate a different solution. A solution that you invent. Modern marketing is so much more difficult than it was in 1990. You, yes YOU, are accountable. A cookie cutter approach cannot work in your specific circumstance. I know, I know, it would be easier if you could color by the numbers. Then you could go back to 1990 and earn a solid middle class salary without investing the kind of effort you have to invest today just to get by. It's not 1990 anymore. It's 2013. For a few years now, everything works, meaning you have to use trial and error and vision to find out what works for your customer. Today, everybody is right. That means that, for your business, everybody is wrong. Yup, Seth Godin wrote this little ditty back in 2007 (click here for your own copy). You start something, it's fun and exciting, and then ... it gets hard. Happened to me in 2009. I am not a fan of trade journals. Back in 2009, a not-so-flattering article was written about me in a popular trade journal. I tried to offer a rebuttal in the comments section. Every time I posted a response, the editor of the trade journal deleted my comment, while allowing those who were criticizing me to post their comments, unedited. I sent an email to the editor, expressing my frustration. My email messages were not acknowledged. Readers continued to pile on. (FYI - a year ago, the article disappeared from the website). Two months later, a major vendor accused me of stealing his business (this did not happen, the accusation was patently false). He loudly criticized me to his community of clients, essentially telling his clients not to work with me. Those clients stopped working with me. In the span of two months, two events essentially out of my control crushed my business. I was fully living "the dip". The first two years were largely easy. Now, not so much. Many of you, too, are in the dip, often because of events out of your control. Maybe a key vendor raises prices, making it terribly difficult for you to compete. Maybe various search terms have become too expensive, hurting future business prospects. Maybe your career is fundamentally stuck. Maybe Amazon is in the process of putting you out of business - generating sales while generating no profit - ever - (click here to read this interesting analysis). Regardless, you enter "the dip". Back in 2009, there were things that were in my control. Integrity. Honesty. Analytics products you could not get anywhere else. Marketing via my blog. Innovative products. A year later, in mid-2010, my business hit a high point that has been maintained since. I created two products during "the dip" that became top sellers. I made the best of my situation, with hard work during "the dip" paying off 2-4 years later. Too often, I analyze businesses that have merchandising problems. Those problems surfaced years ago, leading to a dip today. How you respond to those problems today determines how successful business will be in the future. Start working on a marketing plan for new products, right now! Your house depreciated by 20% over a two year span (with another 20% to come). By the end of 2008, comp store sales were mired in a fifteen months slide. The Dow Jones Industrial average dropped nearly 800 points in one day in September 2008. A plan was hatched to fix the problem. The Troubled Assets Relief Program, or TARP, would provide $700,000,000,000+ of support to keep the banking system afloat. With 110,000,000 families in the United States, each family was essentially being asked to contribute just shy of $7,000 to make banks whole. In the world of consulting, things weren't necessarily all that different! Business leaders wanted consultants to "Fix It!" Like in the video, it's easy to identify a problem. In the real world, it isn't always easy to solve a problem. I worked with a company that figured out how to Fix It! They had a customer acquisition plan, and they had a merchandising plan that integrated with the customer acquisition plan. Combined, the integrated plan (no, not channel integration ... an integration of new customer acquisition strategy with a merchandising strategy) yielded significant growth during a time frame when the global economy was in meltdown mode. On Twitter, you'll get a veritable plethora of advice similar to that described in the video (step one = identify the problem, step two = fix it). In my 6+ years of consulting work, there is one common theme, a theme with three elements, a theme that consistently yields positive results. A strong (and inexpensive) customer acquisition plan. A strong new merchandise development plan. Integration of marketing and merchandising plans. 2008 was the first year I observed a company doing all three things well. In the teeth of an economic catastrophe, as everybody else yelled "FIX IT", this company silently grew. Today, we're knee deep in mobile, and it's retail cousin, "omnichannel". Don't let lust for channel dominance delude you ... focus on inexpensive customer acquisition, a strong merchandise / new item plan, and integration of marketing and merchandising plans.